On 19 November Dame Sally Davies, the UK Chief Medical Officer, announced the establishment of an International Reference Centre for Antimicrobial Resistance (AMR) formed by three Defra Group agencies. In this blog Rod Card (APHA senior scientist for the AMR reference centre) explains why we need the reference centre and work so far. Bacteria, and other pathogens, can be resistant to antimicrobials, such as antibiotics, meaning that they cannot be killed by them. This can be a serious public health and veterinary issue as those pathogens with AMR can survive exposure to antimicrobials and spread, causing infections to persist. The establishment of an international reference centre is therefore an important step in the UK’s global approach to tackling the threat of AMR and brings together the AMR expertise of the Centre for Environment, Fisheries and Aquaculture Science (Cefas), the Veterinary Medicines Directorate (VMD), and the Animal and Plant Health Agency (APHA). The reference centre will harness the expertise of these agencies to provide assistance to partners located in low and middle income countries (LMICs) to support capacity development in investigating AMR and antimicrobial use. The reference centre receives financial support from Defra and UK aid funding from the Department of Health and Social Care’s Fleming Fund. AMR presents a grave threat to public and animal health that could have profoundly damaging impacts on the economy, food security and modern medicine. A 2017 report by the World Bank predicts that AMR could reduce annual global domestic product by up to 3.8% by 2050, with the greatest impacts affecting LMICs. AMR cannot be managed effectively without tackling it on a ‘One Health’ basis across human health, animal health, agriculture, and environmental sectors. In many LMICs, national data on AMR in non-human sectors is sparser, the capacity for surveillance is lower and policies to regulate medicines are less well developed than in human medicine. The International Reference Centre for AMR will therefore deliver capacity building support directly to LMICs in the veterinary and aquaculture sectors to assist with implementing their National Action Plans on AMR. In this way, countries can access technical assistance, training and quality assurance programmes as they build AMR surveillance capacity across sectors. 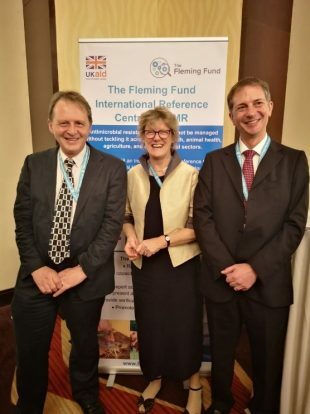 Dame Sally Davies (Chief Medical Officer; centre) with Dr David Verner-Jeffreys (Cefas; left) and Dr Rod Card (APHA; right) at the Fleming Fund reception at which the International Reference Centre for Antimicrobial Resistance was launched. The announcement was made to an international audience of key stakeholders at a reception hosted by the Fleming Fund during the Call to Action on Antimicrobial Resistance conference in Accra, Ghana. As reference centre leads, Dr David Verner-Jeffreys (Cefas) and I (APHA) attended this meeting, presenting a poster describing the reference centre during the launch event, and making many key contacts. The weekend before the reception in Accra, we also took part in the Great Ghana Run 2018 to help raise funds for the Awutu-Winton Senior High School, the only fee-free Senior Secondary School in the whole of Southern Ghana. In the spirit of full disclosure, we walked the 10 km and did not run it as the school students and most other participants did! David remarked “Wonderful school. Amazing what staff and students have achieved in few short years. Wish my sports days were such fun!”. The week prior to the Call to Action meeting, we also held meetings with key stakeholders in Ghana, including the deputy Chief Veterinary Officer, Dr Dontwi, the head of Public Health and Food Safety, Dr Kikimoto, and the FAO AMR National Project Coordinator for Ghana, Dr Afakye. Together we built relationships and identified areas for joint work. 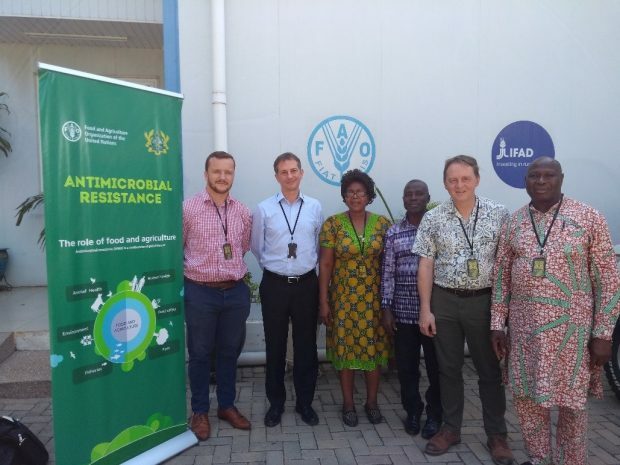 Projects looking at antimicrobial use and at AMR in aquaculture and livestock sectors are now being jointly developed to provide training to Ghanaian scientists and help fill AMR knowledge gaps in Ghana. Meanwhile, Niloy Acharyya, the AMR Reference Centre lead from VMD, was in Tanzania at the Fleming Fund’s delivery partner’s conference. He gave a well-received presentation on the Reference Centre to an international audience of scientists, policy makers, and industry representatives. Although the focus of the audience was primarily on human medicine, the One Health benefits that the Centre will bring to LMICs were widely recognised and supported. The establishment of the International Reference Centre for antimicrobial resistance (AMR) in partnership with the Defra Group agencies APHA, Cefas and the VMD is an important step forward in our work to tackle AMR. We look forward to working with partner nations around the world to help address the threat posed by AMR at a global level, by providing expert advice and training to support capacity development in areas such as awareness, laboratory capability and surveillance.